It's able to work in 2 frequencies simultaneously: for example it's possible to program it to receive at both 433.92MHz AM and 868.8 MHz FM! 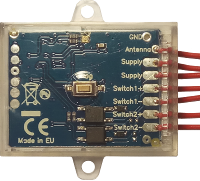 we'd like to present our new universal receiver, 2 channels, compact, in nice transparent case, that can be used with almost every remote controls in the market. Please click on the green button below if you want to receive other updates on our products (less than 10 emails per year) and click on Save Changes. switching mode voltage regulator to reduce power consumption and dissipation: can be supplied at 5-36Vdc or 7-27Vac. We can supply even small quantities, MOQ 5 pcs. Your data is currently used by Creasol for accounting and for direct marketing; data will be kept for 10 years and will not be transferred to other companies or other countries. Please click here to continue receiving news about our products, and Save Changes! Externally supplied, suitable to be installed into a car, in the fuse box, and controlled by highbeam lever or brake pedal. The user can program 1 or 2 frequencies: for example it's possible to set the receiver to work at 433.92 MHz AM and 868.8 MHz FM. Manages up to 60 or 1000 different remote controls, and supports one or more Master remote controls. Only 2 wires, can be installed in less than 10 minutes, and permit to open the main door or gate door or any other system using an electric lock or electric strike plate.